Charles wanted to make some plain collard greens today so I let him give them a whirl. I still love the spicy greens with balsamic and lemon juice but these were tasty too. Of course the great flavor from pork jowl helps! He slow cooked the pork jowl for about 45 minutes over low heat to render out the excess fat and crisp up the meat; bacon or diced ham could be substituted if desired. I forgot to take a picture today so I have inserted my spicy collard greens pic but it will look about the same just taste a bit different! Cover collard greens with water and bring to boil. Reduce heat, cover, and simmer for 10 minutes. Drain and return to pot; add remaining ingredients and cook an additional 10 minutes until onion and collard greens are tender. I learned how to cook tasty collard greens not too long ago from my gal at work. She spent some time in Louisiana at one point in her life and learned quite a few tricks to making some great southern dishes. 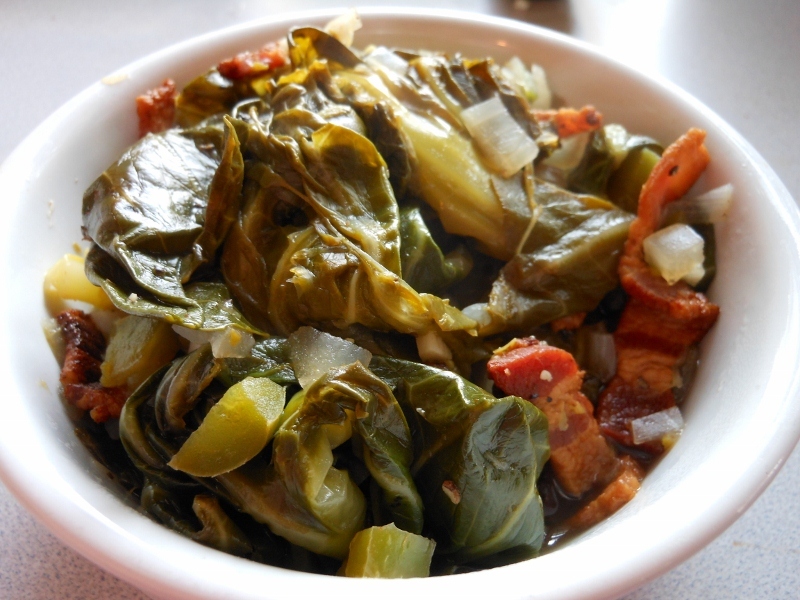 I’d tried collard greens a few times and was never a huge fan of the earthy flavor and the overcooked mush, but back off on the cooking time and add a bit of spice and vinegar and they bring out the best in these greens. 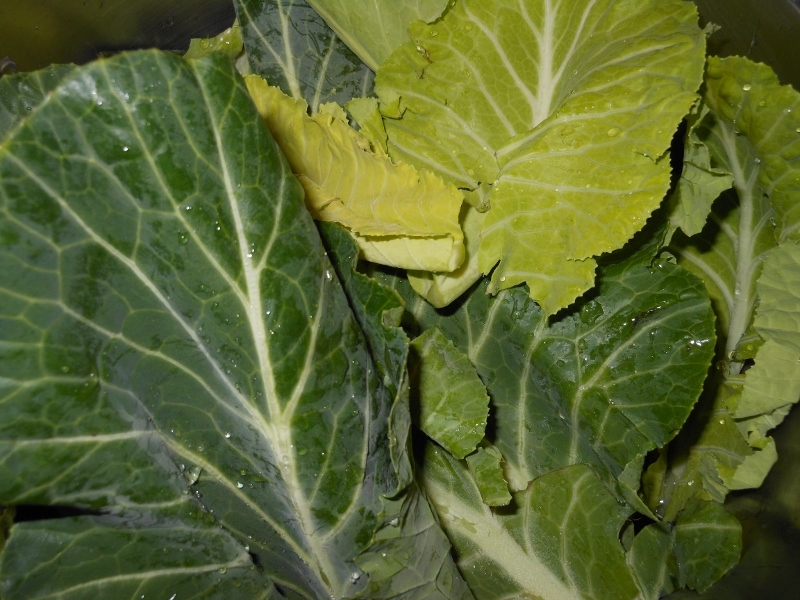 Wash collard greens and remove stem ends ~ peel back middle vein if desired. In large pot add collard greens and quart of water. Bring to boil; cover and cook 10 minutes. 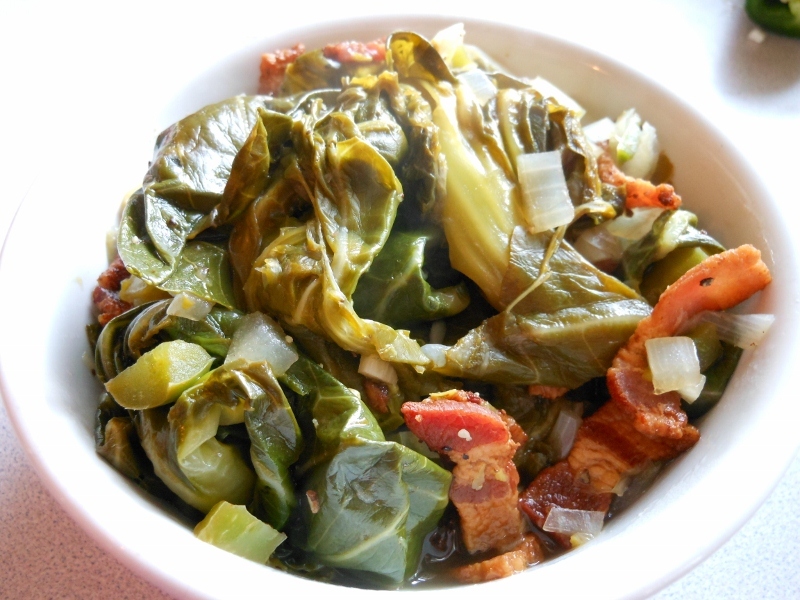 Cook bacon while collard greens are cooking. Drain collard greens; return to pot. Drain bacon and crumble into pan with collard greens. Add remaining ingredients and simmer 10 addition minutes.